They tell us that the French are the greatest romancers in the world (compared to the greatest Romantics, who would of course be the Germans). To this end, I spent my Valentine's Day watching a film directed by a French filmmaker whose 1964 masterpiece The Umbrellas of Cherbourg is essentially synonymous with "gorgeously sad French love story." The director is Jacques Demy, Mr Agnès Varda himself, and the film was in fact the sort-of prequel to that classic Technicolor musical: Lola, a bittersweet black-and-white valentine to the very idea of falling in love. In the beginning, there is Roland Cassard (Marc Michel, playing the character he would reprise three years later) a bored young man living in Nantes. One day out of many spent listening to old women's gossip and drifting through the town's nightlife aimlessly, Roland has two extraordinary encounters: first, he meets the widowed Mme Desnoyers (Elina Labourdette) and her two-days-shy-of-14 daughter Cécile (Annie Dupéroux) in a bookstore, looking fruitlessly for a French-to-English dictionary for the girl's studies. Struck by her resemblance to a friend he last saw as a teenager at the end of the war, he offers to give Cécile his own copy. The girl is thrilled by the present; her mother is thrilled that a handsome young man has just offered to come to their apartment. The far more important meeting comes that afternoon: by utter chance, Roland runs into that very same childhood friend Cécile (Anouk Aimée), who now goes by Lola and dances at a local club entertaining American sailors. One particular sailor is particularly keen on Lola and spoils her and her son; this is Frankie (Alan Scott), hoping to have one last night of passion before he sets off to Cherbourg and home. But Lola still pines for Michel, the sailor she met on her 14th birthday, who returned to her life years later and left her with child. That seems like a great deal of plot, but it's really just the situation; the story is about watching events unfold around those characters, dragging them all down into hopeless love: Roland for Lola, Lola for her long-lost Michel, Frankie for Lola, Mme Desnoyers for Roland. After the fact it's very easy to piece together The Plot, but during the film it doesn't seem that way. It's like lying on a beach in the sun, letting the tide rush up around you and fall back, again and again. The movie is something to sink into, not something to follow. Perhaps the main contributing factor to this feeling is the way that the plot keeps looping back on itself, in what we might call the film's "gimmick," if the film had to have a gimmick. Everything that happens has either happened before, or it will happen again, and sometimes both. Almost every character has at least one double: Frankie and Roland are doubles in their relationship to Lola; Michel is also Frankie's double, but not in the same way that Roland is. The two Céciles aren't just similar because of their names and appearances; it seems almost that the girl is in fact Lola as a child, even though they live in the same time frame. There are two women longing after a lost Michel: one looking for her lover, one looking for her son. All these things combine to make Lola a slice out of time with neither a beginning nor an end, but simply points on a single circle. That circle, broadly speaking, is Love. Everyone goes through it the same way, year after year. What makes Lola work is not a terribly easy matter to discuss, for much of the film, like so many great films, is intuited rather than explained & felt rather than understood. But a good place to begin picking at the film would be to situate it in the greater scheme of French cinema, circa 1961, i.e. the New Wave. In the broadest possible sense, that movement was based on devaluing the classical forms of French cinema and raising the profile of other cinemas that the young men and woman of the movement thought were more important; for some filmmakers this meant genre explorations, for some it meant only that they told stories that might have been off-limits; generally, there was always some formal experimentation involved. What separates Demy's film from the great majority of the New Wave (maybe with the exception of Rohmer) is his combination of New Wave style with eminently classical material. 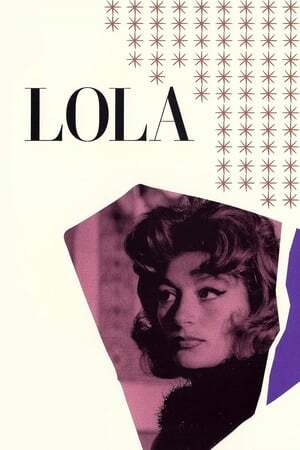 It is not an accident that the film opens with a dedication to Max Ophüls, the deceased German-born director whose final works had been a key part of the landscape of French cinema in the despised 1950s - nor is it an accident that Lola shares her name with one of Ophüls's most important French films, Lola Montès. Yet while Demy's Lola may have an old-fashioned scenario, it is distinctly contemporary in execution. The film was shot by the ubiquitous Raoul Coutard, already underway in his celebrated collaborations with Jean-Luc Godard and François Truffaut, and it bears his unmistakable stamp, in the way that it is somehow both grainy and realistic at the same moment that it is impressionistic and shiny. Or, there is the score by the equally ubiquitous Michel Legrand, and it bears his stamp, soaring Romantic strings that float around on top of the movie, looking for something to latch on to. The film is often called a musical without music, which is not accurate: there is a great deal of music, and one song, Lola's self-titled cabaret number. It is true that this music always threatens to burst into singing numbers without ever quite finding the ability to do so, however, and this is the point that the phrase "musical without music" tries to make. This is all the more obvious given that Demy and Legrand did make a legitimate musical three years later, one in which the music would be even more overpowering than it is in Lola, so much so that not only does it succeed in getting the characters to sing, they never actually stop. But that was still in the future. In the current subject, the lovely score never seeming to quite fit is an example of the frustration that is at the heart of the film's musing about love: wonderful and gorgeous but not something that actually goes anywhere. A mashup between the New Wave and classicism ought to result in a thrilling but ultimately brainy exercise, yet Lola is one of the most emotive movies of its generation. It might just be that Demy, alone of his contemporaries, was willing to grapple with love as itself: Godard treated love as a corruption, Rohmer picked it apart like a lab animal, Truffaut made gentle fun of it, Resnais used it as a gimmick and Chabrol ignored it. Demy made films about how it feels to be in love, and Lola is that theme in its purest state. It is not a happy film, but being in love is not always a happy thing.